The top floors of the hotel charred. Seventeen people, many of them sleeping guests, were killed in a fire at a hotel in central Delhi's congested Karol Bagh area early Tuesday morning. Some of the victims were charred to death and others suffocated in the poisonous fumes. A woman and a child were killed when they jumped off the fifth floor to escape the blaze. A case has been registered against the owner of the hotel, with sections including culpable homicide not amounting to murder. The general manager and another employee of the hotel have also been arrested by the Delhi Police, which has now transferred the case to the crime branch. 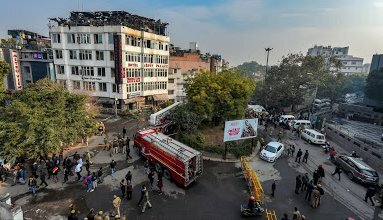 Some 35 people were rescued from the hotel as around two dozen fire tenders joined the battle against the flames, Deputy Commissioner of Police Mandeep Randhawa said. He said while some of them were critical, many others had minor to major burn injuries.